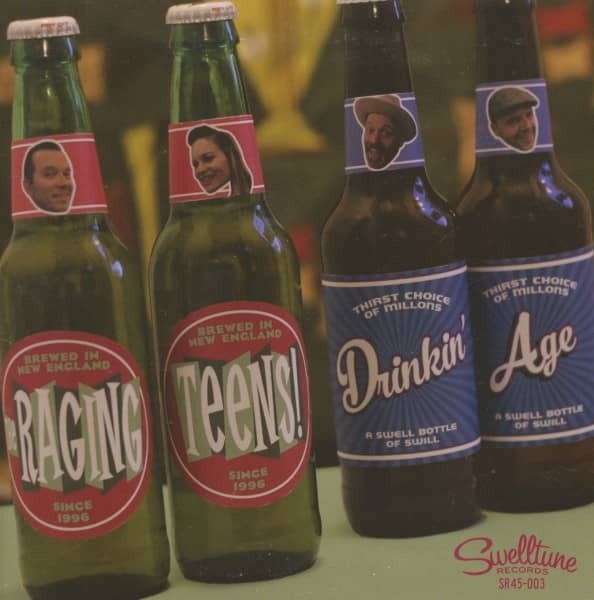 The Raging Teens are reviving the burgeoning American Rockabilly revival with their second full-length and rubric records debut 'Rock 'n' Roll Party (released February 20, 2001). The energetic foursome from Boston, Massachusetts and Portsmouth, New Hampshire has a loyal fan base throughout New England and as they have experienced on various national tours, a strong word of mouth has spread from coast to coast for their excellent live shows. The Boston Globe claims that The Raging Teens "put more sweat and aggression into their songs than the standard rockabilly band," while the Boston Herald called the band's lead guitarist "a twenties prodigy who dresses like a debutante and plays like a demon; she can recapture the solos Scotty Moore played with Elvis in the 1950s without confusing her hair. Snazzy praise for a band whose members (except for one) were all except teenagers when they formed the band in 1997. 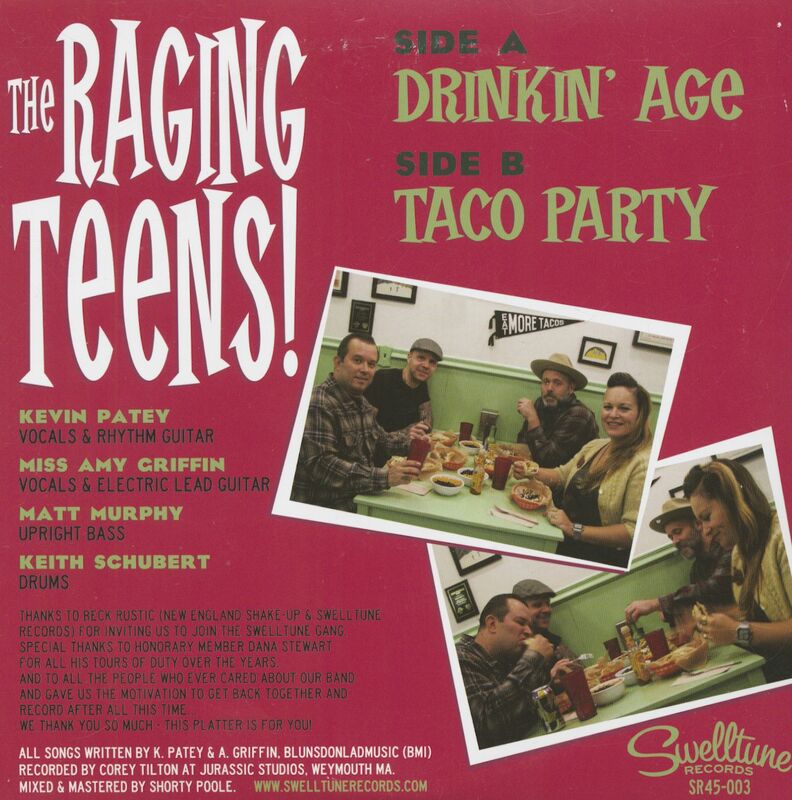 Charismatic lead singer and rhythm guitarist Kevin Patey plays The Raging Teens. Kevin is a veteran of the Boston music scene who played a rockabilly band together with Jack Hanlon of The Amazing Royal Crowns. The rhythm section consists of Matt Murphy, who beats the double bass, and Keith Schubert, who plays the beat on drums. But perhaps the main attraction of The Raging Teens is the lovely Miss Amy Griffin, Rockabilly's first female lead guitarist. Miss Amy may dress reserved, but she plays like hell on wheels. The Raging Teens have not only played sweet solos and broken the hearts of young men on stage with The Raging Teens, but also at every major rockabilly show in New England, including the first annual Rockabilly Ball, the most visited event at the LOUD Music Festival in 1997, recently enjoyed a headliner spot at the Viva Las Vegas Rockabilly Weekend and toured Europe twice to lead Rockabilly Rave in England. They have played with local and national rockabilly acts like Ronnie Dawson, Big Sandy, Wayne Hancock, Ray Condo, Cigar Store Indians and Sun Records legend Billy Lee Riley. However, the appeal of the Raging Teens goes beyond the Rockabilly crowd. They have transformed listeners to their energetic music across the country by sharing the stage with national acts as diverse as Amazing Crowns, CAKE, The Mighty Mighty Bosstones, Mojo Nixon, indie rock heroes The Bevis Frond and ex-replacements Slim Dunlap and Tommy Stinson (with his new band Perfect). Deke Dickerson, Hightone Recording Artist, (from the Dave and Deke Combo) developed ROCK AND ROLL PARTY in his Ecco-fonic studio in Los Angeles and used only vintage recording equipment for an absolutely authentic sound. Customer evaluation for "Drinkin' Age - Taco Party (7inch, 45rpm, PS)"